Winslow United manager Scott Reynolds was full of praise for his side’s performance after their 2-1 defeat at home to leaders Hatfield Town. United, who are bottom of South Midlands League Division One with just five points from 13 games, produced their best performance of the season and were unlucky not to come away with at least a point against the league leaders. Reynolds said afterwards: “It was our best performance of the season by miles. The lads kept things very simple and worked their socks off, which was very pleasing to see. “We were superb in the first half and looked dangerous every time we went forward. Had we gone in leading at half-time , I could only see one side going onto win. “Unfortunately that wasn’t the case after a soft penalty given by the referee. Weymes made a tremendous save, but they were first to react to scramble home an equaliser. “The second half again was all about us, apart from one soft corner conceded and poor marking allowing them to get themselves in front. “Chance after chance went by as second half developed and had we found the equaliser the away side could have had very few complaints. “All in all, it was another loss, but by very fine margins against the league’s’ top team. Winslow, boosted by the return of former players Ryan Freshwater and Joey Acheampong, made the perfect start when Tom Weymes’ long ball forward eluded the ene Hatfield defence and allowed Acheampong to nip in, round the ‘keeper and slide home. The hosts came agonisingly close to doubling their lead when Acheampong’s toe-poked effort went inches wide before Hatfield were gifted a route back into the game after being awarded a soft penalty. Despite Winslow protests, the penalty stood and though Ben Collins saw his effort brilliantly saved by Weymes, Matt Hodges was first to react to the rebound to fire home. 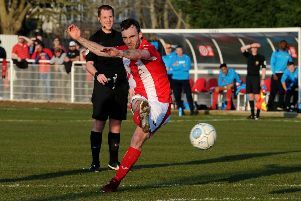 United had chances to retake the lead, most notably through Grant Karwacinski and Ayden Bailey, but Hatfield scored what proved to be the winning goal within a minute of the restart when Hodges slammed in his second. Despite numerous opportunities, the home side were unable to find a second goal as they slumped to their 10th defeat of the season. Winslow entertain Edgware Town this weekend.